In just one week, nearly 2,000 translators and interpreters will convene at ATA’s 58th Annual Conference. Memories of last year’s event abound, and The Savvy Newcomer is pleased to present the results of a mini-survey we conducted at the 57th Annual Conference in San Francisco whose goal was to examine trends in the backgrounds of translators and interpreters, particularly those who have enjoyed long careers in the field. Some of the aspects we looked at in the survey were: highest level of education, areas of study, how often translators and interpreters transition to these fields from a prior career, and for those who have transitioned, the ways in which their prior professional experience has influenced their careers as linguists. 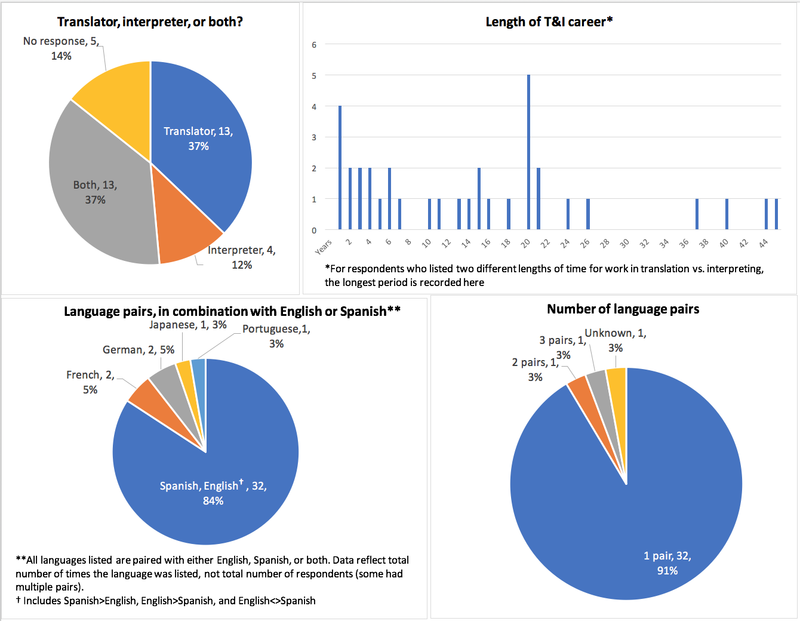 Language combinations: Overwhelmingly Spanish-English—in one direction or bidirectional (32 respondents, 91.4%); but French (2), German (2), Japanese (1), and Portuguese (1) were also listed in combination with either English or Spanish. Number of language pairs: The majority had one working language pair (32, 91.4%), whereas only 3 (8.57%) had two or more language pairs. Some of the most compelling findings were in relation to prior studies completed by those surveyed. Of those who responded to the question “What is your highest level of educational achievement?”, 82.86% (29) had earned an associate’s degree or higher (the remaining 5 respondents had completed university courses, but 4 did not specify whether they had completed a degree). A striking 47.5% (16) reported having earned a master’s degree as their highest educational achievement, while approximately 25%* (9) held at least a bachelor’s. 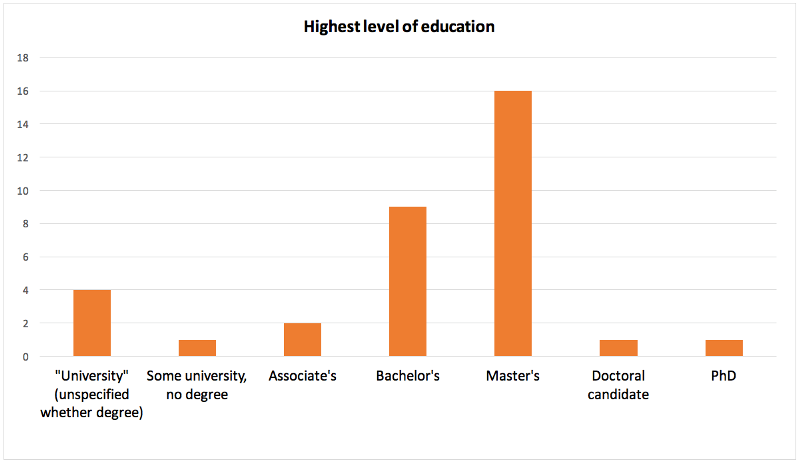 (*The responses of the 4 mentioned above who did not specify their highest university degree suggested they had earned at least a bachelor’s, which would bring the total of bachelor’s to 36.43%.) One respondent held a PhD (1), and another was a doctoral candidate (1) at the time of the survey. Respondents had earned degrees in 16 different countries (with some overlap): Argentina, Canada, Colombia, Costa Rica, Cuba, Ecuador, France, Germany, Mexico, Peru, Puerto Rico, Spain, Uruguay, Venezuela, the United Kingdom, and the United States. There were a total 29 prior fields of study reported, including T&I. Seven (20%) reported having studied T&I, of whom one held a master’s in translation and another a bachelor’s, whereas the other 5 reported having participated in a certificate or other non-degree program. Most fascinating was the incredible variety of areas of study beyond T&I itself. There was truly a range from A to Z (well, to T for translation, to be precise! ): from art history to social work, advertising to computer programming, finance to music, education to philosophy, and interior design to hotel management. We also saw journalism, linguistics, psychology, law, anthropology, and geography. 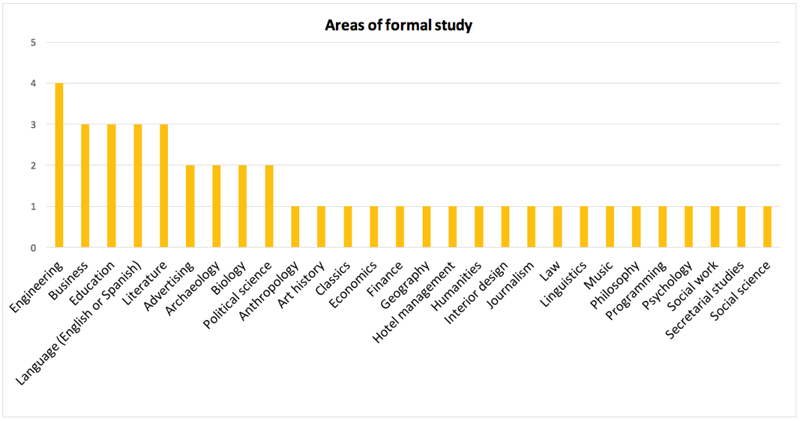 Of the 29 fields reported, 9 had some overlap: engineering (4, 11.42%), business (3, 8.57%), education (8.57%), Spanish or English (8.57%), literature (8.57%), advertising (2, 5.71%), archaeology (5.71%), biology (5.71%), and political science (5.71%). The reasons respondents gave for switching from another career to T&I were varied: While some felt the need for a change and decided to intentionally put their language skills to use, others seemed to find themselves in the career inadvertently and never left. Considering the relatively small sample of 35 respondents, the variation in experiences observed was remarkable, leading us to conclude that the individuals behind the professions of T&I, the paths that led them there, and their specialized knowledge, are as diverse as the languages they speak and the countries they hail from. Aside from their current careers, the one thing they seemed to have in common was an impressive level of formal education. To think that these 35 individuals make up only a tiny fraction of the attendees at the ATA Conference each year brings into perspective just how magnificent our colleagues are. 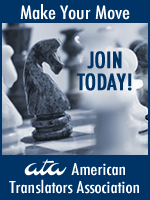 Whether you have plans to attend a local conference or meet-up this fall, or plan to join the ATA Conference in Washington, DC, you can be sure you will be in extraordinary company. Emily Safrin is an ATA-certified Spanish-to-English translator and the owner of Saffron Translations. She has lived between the US and Spain since 2004 and earned her master's in intercultural communication and public-service translation and interpreting from the Universidad de Alcalá in 2014. She specializes in translating from Castilian Spanish, with a focus on the medical/pharmaceutical and culinary sectors. Emily is also a certified Spanish-English health-care interpreter (CCHI, Oregon State). She serves as Director of the Oregon Society of Translators and Interpreters and an author and editor for the ATA PR Writers Group. Emily has a personal passion for food and cooking and flamenco. Follow her musings on translation and Spanish culture on Twitter at @saffrontrans.